COURTESY CALL. 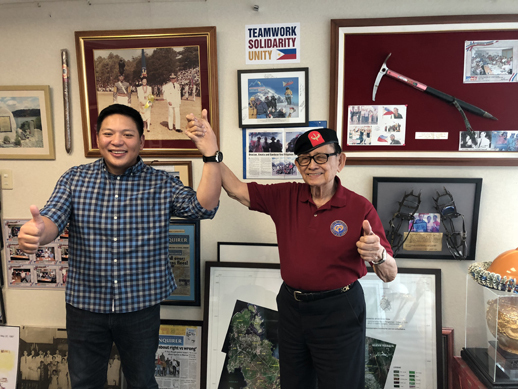 Former President Fidel V. Ramos welcomes JCI World president Brian Lim, head of the 102-year-old JCI movement of young leaders with ages ranging between 18 and 40 years old from 124 countries. Lim, a native of Pangasinan like FVR, told the former Chief Executive that young leaders have always followed FVR's lead on promoting patriotism, good governance, global diplomacy enduring peace and sustainable development owing to the six tenets of the Jaycee's creed. Lim recently paid a courtesy call on the former leader in his office. “I am happy that you are now serving as the country’s Ambassador of Goodwill being the sixth Filipino to serve as JCI World president,” Ramos told Brian Lim whose father, Benjamin S. Lim, once served as JCI World EVP and JCI Philippines national president and as Duty Free Philippines general manager during the Ramos presidency. It must be noted that JCI’s roster of illustrious Filipinos who served as presidents include: Roberto del Rosario (1950-1951); Roberto Villanueva (1952-1953); Feliciano Belmonte (1976); Victor C. Luciano (1985); Crispin Dy (1997); and, Marc Brian Lim (2018). Lim now heads the 102-year JCI movement of young leaders between 18 and 40 years old from 124 countries. Over a century, the JCI movement has encouraged young people to become active citizens and to participate in efforts towards social and economic development and international cooperation, goodwill and understanding. For his part, Lim told the former Chief Executive that young leaders like him has always followed his lead on promoting patriotism, good governance, global diplomacy, enduring peace and sustainable development owing to the six tenets of the Jaycee creed. Lim, who is concurrent two-term vice mayor of Dagupan City, paid a courtesy call on Pangasinan’s favorite elder statesman to inform and seek FVR’s blessing about his decision to run for mayor in next year’s midterm elections. “Don’t forget to continue loving your parents, Benjie and Celia, who have paved the way for your good fortune, education and training. Go ahead on your decision and rest assured that you have the good and right people on your side, myself included,” Ramos said. He advised Lim to continue preserving Dagupan City’s bangus (milkfish) industry and arrest the perennial flooding which has greatly affected the lives of many Dagupenos including the business and educational sectors. The decision of Vice Mayor Lim to run for mayor has excited many political pundits including the entry of former City Councilor Alfie Fernandez as his running mate in the May 13, 2019 elections, thus reviving the formidable LIFE (Lim-Fernandez) Team forged by his father Mayor Benjie Lim and the late mayor Al Fernandez Jr. when he allowed his son lawyer Alvin Fernandez to be BSL’s running mate in the 2001 local elections.